Summertime used to mean trashy paperbacks stuffed into a beach bag, dog-eared pages faded from water, coconut oil and sunshine. This year, we're not even making it to the beach but I still want to catch up on some fiction reading. Sadly, it seems like all I ever read these days are parenting tomes filled with advice on getting your baby on a sleep schedule or disciplining your mouthy preschooler. Or picture books. It's time for a little break. Some summer fun. But who has the patience for reading those bodice-rippers anymore? They're virtually science fiction to me, in my world of diaper duty and playdates. Puh-leez. 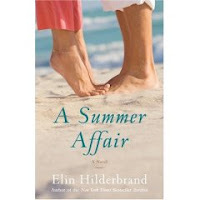 MotherTalk sent me a copy of Elin Hilderbrand's latest book, A Summer Affair: A Novel to review. It is unabashed poolside prose for REAL moms. It tells the story of Claire Danner Crispin, a beleaguered mother of four who has given up her promising career as a glassblower to raise her brood in Nantucket. She has an unsupportive blue collar husband, a feisty Irish sister in law, a Thai au pair and an obligation to co-chair one of her community's schmancyest charity galas. And did I mention four kids? To ensure the gala's success, Claire must call on her high school sweetheart (who has grown into a rock star of epic proportions, haven't all your exes?) to perform AND bust out her dusty glassblowing chops for a massive commissioned work in the auction. While simultaneously carrying on an affair with the charity's director, who is married to a woman who was injured in a drunk driving incident that she may or may not be responsible for– Claire didn't make her get into a taxi even though she was obviously soused at their girl's night out… and has felt guilty ever since. Not guilty enough to stay away from her super-rich philanthropist husband, though. Oh, the drama! Okay, my life is far from Claire's. Perhaps it isn't that realistic (Do people in Nantucket really have crazy names like that?! Lock Dixon and Claire Danner Crispin? Really?) but it is a fun read, especially in the year of my 20th high school reunion. It's way more Lands' End than Louboutin, and there's no Fabio in sight. A Summer Affair: A Novel is available at Amazon.com. Not sure about the names, but I was wondering if they really have lives like that! Oh, the drama!